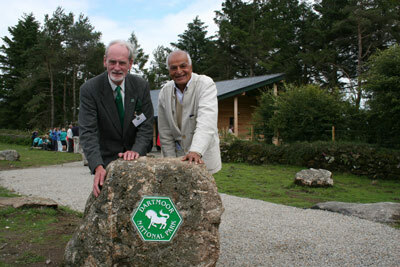 A new information centre in Dartmoor was officially opened today by writer and BBC presenter Satish Kumar. The building, below Haytor Rocks on the eastern edge of the Dartmoor, has been built to have a low impact on the environment. The centre, run by the Dartmoor National Park Authority, used local wood for construction and insulation made from sheep’s wool. A roof space has also been provided to encourage bat nesting. Information panels and audio –visual displays inside the centre tell the story of the Haytor area from prehistory to present-day. Guided walks using audio files including music by Dartmoor folk musician Seth Lakeman are available, both in the centre and online on the national park authority’s website – click on the ‘visiting’ button. Mr Kumar, who presented the BBC Natural World documentary, Earth Pilgrim, said: “Dartmoor national park is a spellbinding place; a place where I find inspiration, tranquillity and renewal. “Each time I experience its hills, woodlands, river valleys, ancient wonders and wildlife I discover something new. “The new Haytor Centre is a marvellous starting point from which to begin your own journey of discovery, experience some of the wonders of this special place, slow down and recover from the pace of daily life. The information centre is open daily throughout the summer from 10 am to 5 pm.